We might not live in the coldest part of the country, but given the seasonal changes in temperature, Massachusetts residents should be aware of the hazards of frozen pipe bursts, but more importantly, ways in which homeowners can prevent them. While a pipe can freeze at any temperature below freezing, pipes tend to freeze when the temperature is at or lower than 20°F. You should be aware of the potential for a pipe to freeze at all times during the winter months, but especially during periods when the temperature drops to 20°F or lower. Pipes that are prone to freezing are those that are outdoors, in low heated areas, exposed to cold air, or which lack insulation. Risky locations include an outside wall, under a sink on an outside wall, or an unheated crawlspace. Once a pipe in a risky location freezes, the pipe rarely bursts in the location of the freeze. Instead, water pressure builds up downstream from the freeze, eventually causing the pipe to burst. One of the best methods for prevention of frozen pipe bursts is to keep pipes well protected, insulated, and heated. If you’re building a new home, ensure that you avoid placing pipes in places that are more likely to be exposed to freezing temperatures. In both old and new homes, ensure that exposed pipes are properly insulated. In addition, make sure to insulate and seal any cracks or holes which might expose a pipe to the elements. If you’re worried about a short-term pipe freeze, overnight for example, leave a faucet slightly trickling. This won’t necessarily prevent a freeze, but should a pipe freeze, it may help alleviate pressure and avoid a pipe burst. If you’re going away on vacation, turn the water off in your home and clear all the pipes by letting the water run for several minutes after you have turned the water off. If you have outdoor pipes, for garden hoses, unplug any garden hoses during the off-season, turn off the outside water pipes, and then clear the water out of those outside pipes by allowing the water to run for several minutes. 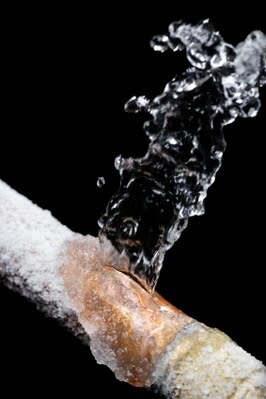 Another way to avoid frozen pipe bursts is to invest in a freeze alarm or IP thermostat. Freeze alarms and IP thermostats work through an internet connection to alert a homeowner of when their home drops below a certain temperature. Some of the most basic ones will simply call a phone number with an automated message, alerting the owner of the drop in temperature. More advance ones can be remotely controlled, even through a computer or iPhone. IP thermostats can help you save on your homeowner’s insurance, and they are ideal for people with multiple homes, allowing them to monitor their home temperature when they’re not there. What if I suspect a frozen pipe? If water stops flowing or is slower than normal, you may have a frozen pipe. If this is the case, it is essential that you unfreeze the pipe to avoid a burst. To find the frozen pipe, first turn the faucet on where you suspect the frozen pipe is connected to, and allow it to trickle, if possible. Then, follow the pipe that connects to the faucet. Often times a frozen pipe will have frost or ice built up around the outside of the pipe. Remember, likely areas for a frozen pipe include an unheated crawlspace, pipes under outside sinks, and pipes in outside walls. If you find the frozen part of the pipe, there are several ways to heat the pipe. One of the best and most common ways is to use a hair drier on the affected area. You can also use a heat lamp, a portable heater, or electrical pipe heat tape. Avoid using any kind of open flame, as this is a cause of home fires. Remember, when you’re de-thawing the area, make sure to thaw from the faucet towards the frozen area, as this will allow thawed water to drip out of the faucet, alleviating pressure. If you need to report a claim, you can check our website, or call us at (508)-540-2400.